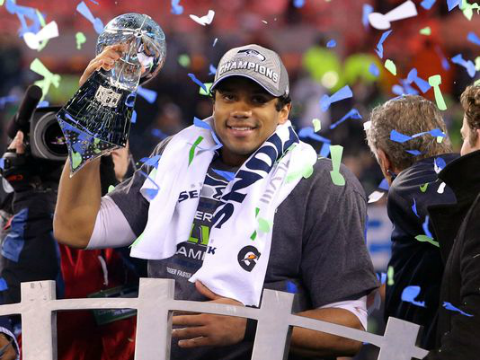 To Be Calimquim » Blog Archive » Seahawks are Super Bowl Champions! Going into the Super Bowl, the Denver Broncos were the most prolific offense in NFL history. No other team in history scored more points than the Denver Broncos and no other QB threw more TDs than Peyton Manning. However, all those regular season stats were all for naught as the Seahawk defense smothered the high-powered Bronco offense, who didn’t even score until late in the 3rd quarter. Russell Wilson had a stellar game throwing for 2 TDs and helping to convert more than 50% of 3rd down conversions. Percy Harvin, who was hardly used in the regular season, had a blow-out game, which included a 87-yard kickoff return to start the 2nd half. Malcolm Smith, who ended up being the Super Bowl MVP, had a key interception pick-six and a fumble recovery. However, the star of the game was the Seattle defense led by Cliff Avril’s relentless pass rush, and, of course, the Legion of Boom, who suffocated the Denver WRs. Not since the 1991 Washington Huskies football team, did I get to celebrate a legitimate Seattle-team champion. Hopefully, going into the 2014 season, the Seahawks can continue their winning ways and end up in the Super Bowl again. Go Hawks!